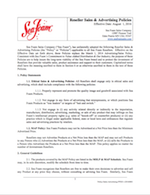 Though industry has evolved in all segments over the last number of years, Sea Foam’s standards have remained the same: do business in an ethical manner; provide vehicle and equipment owners with high quality products, as well as the education and support necessary to realize the full benefit of such products; support our channel partners; and support our industry in general. Sea Foam promotes its products by employing a nation-wide salesforce charged primarily with the task of providing education and support to the many professionals employed by the automotive, marine and small engine industry. 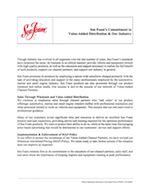 Sea Foam products are also promoted through our product literature and online media. Our success is tied to the success of our network of Value-Added Channel Partners. We continue to emphasize sales through channel partners who “add value” to our product offerings: automotive, marine and small engine retailers staffed with professional mechanics and other personnel trained to work on vehicles and equipment. This ensures that our end users receive professional guidance. Many of our customers invest significant time and resources to deliver an excellent Sea Foam product end-user experience, providing advice and training required for the optimum performance of Sea Foam products. We want to protect their ability to do so, while at the same time discouraging price-based advertising that would be detrimental to our customers’ service and support efforts. In our effort to protect the investment of our Value-Added Channel Partners, we have revised our Minimum Advertised Pricing (MAP) Policy. We stand ready to take further actions if the situation does not improve as expected. Sea Foam remains firm in its commitment to the education of our channel partners, sales staff, and end users about the importance of keeping engines and equipment running at peak performance.